Following the annual release of the Federal Housing Administration’s annual report to Congress on the status of the agency’s insurance fund this year, opinions abound about the sufficiency of recent reverse mortgage program changes and the state of the fund going forward. One opinion that emerged following the report release was that of former FHA commissioner and former Mortgage Bankers Association president and CEO David Stevens. Stevens, who served as commissioner from July 2009 to March 2011, offered commentary in response both via LinkedIn and other outlets, including an assertion that the reverse mortgage program should be rebuilt from scratch. RMD spoke with Stevens by phone to learn more about his ideas for reshaping the program. For starters, Stevens said, the ideal of a credit requirement and residual income test needs to go further than it does with the current financial assessment that is required of all loans. During Stevens’ tenure at FHA, the agency created the HECM Saver, an adjustable rate product with lower upfront fees and a lower draw percentage, but the product eventually was eliminated. The Saver was designed to offer an alternative to the full-draw fixed rate offering, but the execution was lacking, Stevens said. While there may not be a quick repair to the reverse mortgage program, there is action needed, Stevens stressed in his comments. Recent changes have been effective, he said, crediting the work of Commissioner Brian Montgomery, who took the post in May. Most recently, Montgomery has spearheaded change in the form of a second appraisal required for some borrowers—a process aimed at stemming losses related to appraisals. Some alternative suggestions might include incorporating family members as co-signers, or setting certain requirements that would relate directly to available principal limits, he continued. 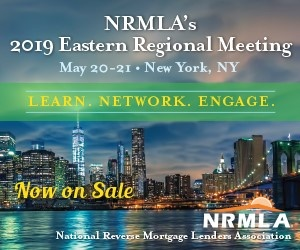 As for whether additional program changes are necessary, time is needed following the most recent changes to gauge their impact, said National Reverse Mortgage Lenders Association Executive Vice President Steve Irwin in an email to RMD.